Facing South On Coast Guard Beach On Cape Cod. I posted 2 photographs yesterday of the gorgeous clouds on Coast Guard Beach, part of the National Seashore. No matter which way you looked the clouds were amazing. I turned around facing the opposite direction, looking toward Nauset Spit, and this is what I saw. Beautiful, don’t you think? 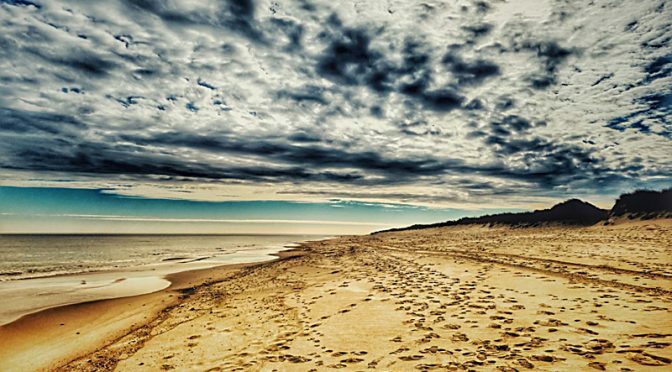 Previous PostCoast Guard Beach On Cape Cod In Horizontal or Vertical?Next PostOur Wiley Park Loop Hike On Cape Cod Is On The AllTrails App. Such a great contrast between the flow of the sea and the puffs of the clouds!